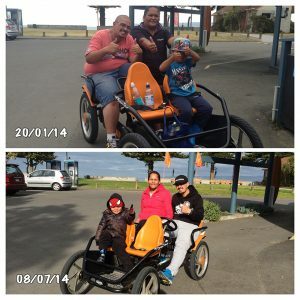 When young couple, Kara and Marg Hull, joined the Sport Gisborne Tairawhiti GRx programme in January 2014, Kara weighed 142.7kg and Marg weighed 127.8kg. They were stuck in a rut and had to make a change for themselves, each other, and their young son. A visit to the GP for blood tests turned into a lifestyle change for Kara and Marg Hull. It had been 10 years since Kara had last weighed himself and he was now 142.7kg. In tears, he texted his wife Marg saying they needed to make some changes. He felt selfish that he had deprived himself, his wife and their young son, Christian, of a healthier lifestyle. A GRx Client Support Advisor met with Kara and Marg and quickly realised they had unwittingly become each other’s worst enemy. Kara had accepted that he would always be the “big guy”, while Marg had been ready for some time to make changes but was waiting for Kara to come onboard with her. It became a struggle when one would try to eat healthier and the other was having takeaways. They were encouraged to make small lifestyle changes and take advantage of the different activities available in the community. Kara joined a cardio programme at the YMCA with personal trainers, Len Wawatai and Gerald Eaton, and immediately started dropping the kilos. “My biggest challenge was walking through the doors of the YMCA Gym. I was embarrassed about being seen as the ‘fattest’ guy there,” Kara said. At the same time, Marg was encouraged to take part in a 10-week challenge run by Freedom Health & Fitness, but her greatest weight loss came from walking up and down Kaiti Hill every day. “The first two weeks were the hardest. What took me 1.5 hours to do now only takes me half an hour,” Marg said. Making sustainable changes to Kara and Marg’s diet was also a focus. Kara was able to change his eating habits quite quickly. He went from having a two-litre bottle of fizzy or sometimes even more every day, to now only drinking water. For Marg, the challenge was to stop drinking coffee. She was having seven to eight cups daily with two teaspoons of sugar in each cup, plus biscuits or cake. But she was able to kick her coffee habit over the course of two weeks. With the support of the GRx programme, the couple has been able to make life-changing progress, both mentally and physically. Their young son, Christian, has noticed the difference in his parents and they all enjoy more physical activities together. Marg, who once stood at the back of her Zumba classes, is now up in the front row or dancing on stage. She won her first Freedom Fitness Challenge, and completed a Mother’s Day Triathlon and 5km run earlier this year. “She is a lot more sociable, happier and full of confidence. This is the women I first fell in love with,” Kara said. Kara has gone from saying “no” to everything, to accepting all the challenges that come his way. He joined a Freedom Fitness Challenge, completed the 8km Tough Mudder event, and is now looking forward to doing the ¼ Ironmaori in December as part of a team. At the time of being interviewed, Kara weighed 93 kg and Marg weighed 93.2kg – that’s a combined weight loss of 84kg in just over five months! From never considering the possibilities, they both continue to lose weight and hope their story will inspire others to make positive lifestyle changes.